Our stock is always changing, so we recommend stopping by our shop to see what’s new. Give us a ring if you’re looking for something specific. David, I like the site. Thanks for talking yesterday. I’m not sure if we can help, that will be up to you to try and figure out. I know that our product sells. If you have more questions about TACO please feel free to call me direct. My cell is 949-310-0057. Good luck no matter your decision. Hola amigos como esta? les escribo desde Argentina. Quisiera comprar el gorro de sector nine. Hacen envíos a Argentina? We are one of the first factories dedicated to longboard manufacturing in China. We are manufacturing for variety of the popular high end longboard brands, a few are the largest high end longboard brands in the industry today. We currently have two plants, one located in Southern China, with a focus on high end niche market products; another one located in Northern China, focus on mass market production. We were the first company employed CNC machine, robotic arms, and developed propiertory glue system for longboards in China. In order to achieve highest possible quality standard, we are highly verticially integrated in the manufacturing process, from importing/peeling logs, deck manufacturing, heat transfer printing, to assembling, all done in house. Our QC team has trained eyes for perfection. If you have any needs for long board OEM/manufacturing, please let me know. I’ll be very happy to assist you. No need for Skate City Supply to use wood veneers from China, Fabiano Batista. They already get their wood from a board manufacturer that uses superior quality maple veneers from NORTH AMERICA. And have the option of numerous longboard/downhill/freeride shapes through their existing supplier. Im kinda curious of the prices. Im in alamogordo and its almost impossible to get wheels unless you order them. im th ekinda person that wants to look at stuff brfore i pay for it. Do you have atom jukes, suregrip zombies, or radar zodiacs, or radar devil rays? what are the price ranges. I would like to get my team up there to look around. thanks! We do carry Radar Wheels. And the price does kind of depend on the wheel. Would you want that shipped? How’s it going guys. My name is Steven Tongson, and I am the owner of the first and only full print publication for the sport of scootering in The USA, Dialed Scooter Magazine. Dialed is not just sold and distributed in the USA, but also throughout Australia, New Zealand, The UK, and soon Europe as well. I’ve been riding since I was 14 years old and I’m 26 years young now, and I started up Dialed a couple of years ago. I was wondering if you guys would be interested in carrying some copies of the magazine and becoming one of the shops in Canada to carry Dialed. If this is something that you are at all interested in, please let me know. At your request we can send you a sample of the magazine online, or we can send you our last issue straight to your door. Let me know if this is something that interests you, and we will move forward. Thanks a lot for your time, take care. P.S. Let it also be known that if your shop ever decides to advertise in Dialed along with the numerous other shops/companies, they will receive the magazine at a discounted wholesale price. What is the cheapest price for just a the deck? I just started doing roller derby, I need a “rookie package” if you have one. I live in El Paso I have to order everything, I like to keep my transactions local. Sooooooo. Do you have any packages? What are they? I need good skates I kept falling cause the skates I was practicing on where so old and messed up…. I would like to place an order if possible. Hello! So my 13yr old daughter got a kmart brand skateboard for christmas last yr from her uncle. The wheels are the slow generic kind. Do u have upgrade kits that I could use on her board? We do. Generally complete skateboards bought from stores like that are bottom of the barrel, and are usually very poos quality. I’d say bring in the board and we can go from there. Hello I was wondering if you guys have any USD or Xsjado skates in stock. I am looking for USD Carbon IV and Xsjado 2.0 specifically. Also would like to know if you have any SL Razors or other lightweight skates like Valo JJ light etc. Hi there! Do you carry children’s roller skates and gear?? We do! Come on in and check them out. Yo! Can I get an email address to contact your shop directly? Thanks! we do have those in stock. Hey, I was just wondering about the Skate City 225 trucks, are those available for purchase, in possible bulk, anywhere? We do not have them in bulk. I would check it with nhs. Let me know when ya release the shop dawg stuff!!!! I have some mini setups that are built perfect for a kid his age. Wal-Mart boards pale in comparison to the boards we carry. Come by and check ’em out. What kind of bundles do you guys have for boards, boots, and bindings? I’m looking to get a whole new set up next weekend and would rather shop local than order online. It depends on what ya need. I have some really good deals on board and bindings, but running a bit low on boots. I need to buy these trucks for my banaboard gold cup . We don’t have those anymore unfortunately. Sorry! I am reaching out to you because my band Puff Puff Beer from Oakland, CA is coming to Albuquerque in the middle of August and we were wondering if we could drop off some of our music/flyers at your store or possibly even do a in store performance. We are doing a 30+ city tour and are goal is to promote our band in various ways. Half of our band skates and we thought it would be awesome to promote to people with similar interests as us. We would love to do a small daytime performance at your store if possible, to promote our show that night at Low Spirits on August 22nd. However, if this isn’t realistic we would love to drop off flyers or music CDs. We are not looking for any sort of compensation just a place to promote our music. Please let me know if one of these options might be possible. Thank you so much for your time. I hope to talk to you soon. Definitely! Come by and we’ll throw up some flyers for sure! Where is a good place to find out about skateboarding events to participate in, in Albuquerque? Check out NMX on Facebook! Can I buy a set of Skate City 225 trucks from you? I can’t find them anywhere. We don’t have any at the moment either. Bit of a bummer, but I think those are done for. Hey there. I’m in a pop punk band from Albuquerque New Mexico called Call It Quits! We are currently looking for a new lead singer and we were wondering if we could put a flyer up in the two Albuquerque locations (the Coronado Center and the Cottonwood Center). Let us know if that would be possible. Come by and give us a flyer! We support local music. Hi skate city.I was wondering if I got all the parts, how much would it cost to have you guys put it together for me. Depends on what ya got. If ya get stuff from us the assembly is free! Do you guys deliver? I love in Missouri but this is one of my favorite skate shops i’ve been to. I would love to have more of your clothing but with out the drive lol. We can definitely deliver you some stuff, man! Is shipping to Belize possible? Please confirm and also if you accept VISA or MASTER CARD for payment for an international order. I thought you would like to know, it looks like you’ve misspelled the word “Orangatang” on your website. Silly mistakes can ruin your site’s credibility. In the past I’ve used a tool like SpellingScan.com to keep mistakes off my website. It’s not spelled incorrectly. That is actually how the longboard wheel brand Orangatang is spelled. We are a clothing company based out of Baltimore. We’re spreading a strong message of bringing people together. A good friend of ours suggested we get in contact with you. We’d love to talk to you and see if we could get some stuff into your store! Your shop looks awesome by the way! Hello, do you have something similar to a Cal 7 Complete Skateboard, Popsicle Double Kicktail Maple Deck, 7.5 x 31 inches, Skate Styles in Graphic Designs? I’m not familiar with the brand but we have plenty of 7.5 completes. 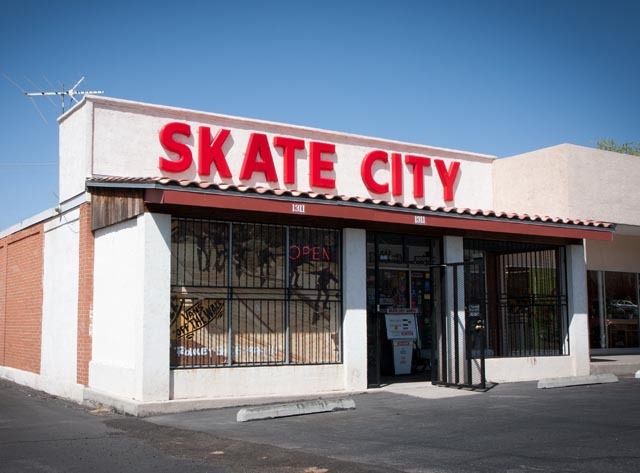 I am happy to tell you that Skate City Supply was chosen for the 2018 Best of Albuquerque Awards in the category of Sports & Recreation. The Best of Albuquerque Award was created to acknowledge the best businesses in our community. It can range anywhere from 82 dollars to 200 depending on what you want.